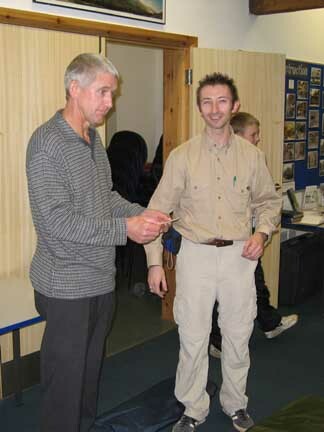 Date : 12th November 2005. Evening meeting. 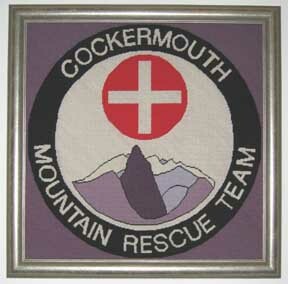 Location : Cockermouth Mountain Rescue Team Headquarters in Cockermouth, Cumbria, UK. 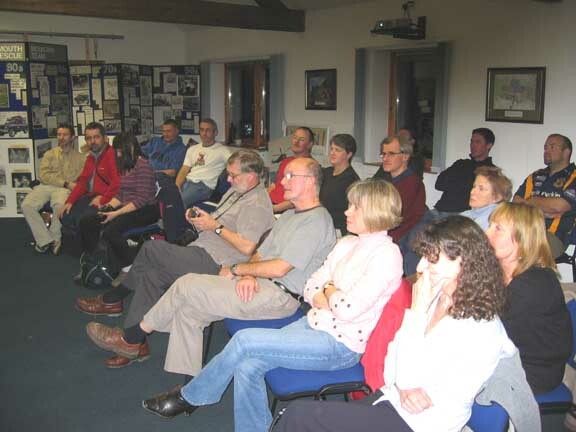 Details : The On-line Fellwalking Club, normally an internet based group of friends, had ventured into print and raise money through the sale of their journal "The Lost Sheep". We decided to donate the money to a good cause and one close to our hearts. Click here or on the Badge for a link to their site. 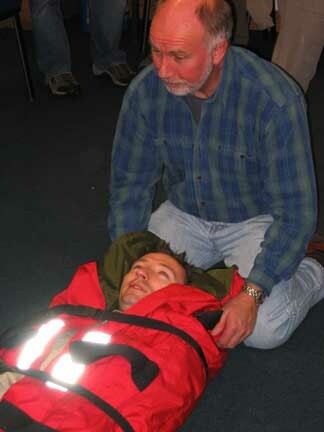 We met at the MRT base in town and following a brief introduction, watched a short video of a typical rescue scenario. 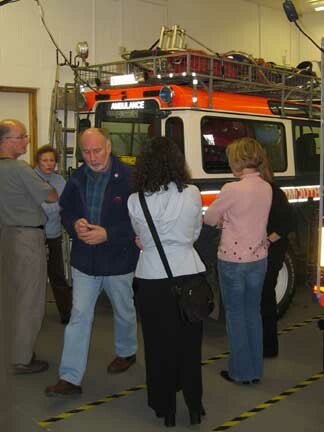 We were then given a conducted tour of the building . 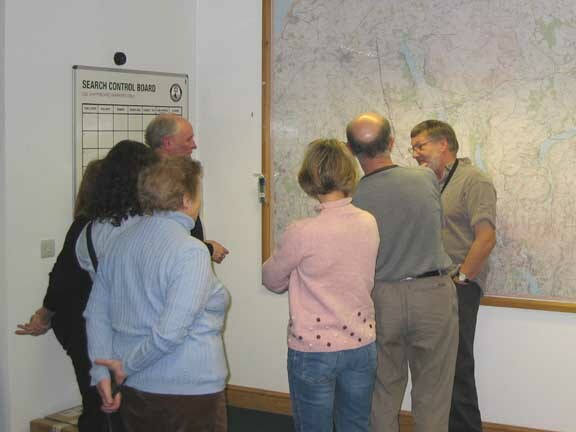 . .
and shown the map of the team's area. 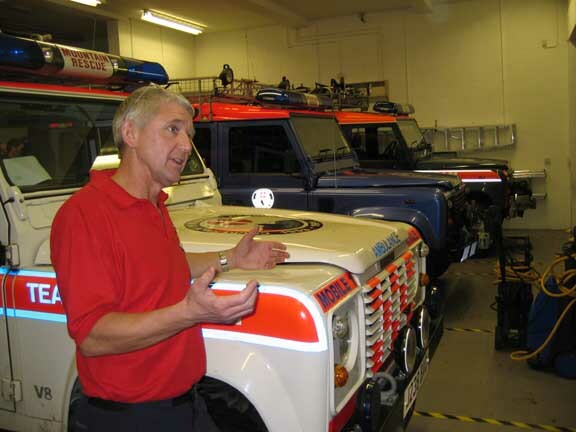 three Land Rovers equipped to carry equipment and personnel out to any incident. 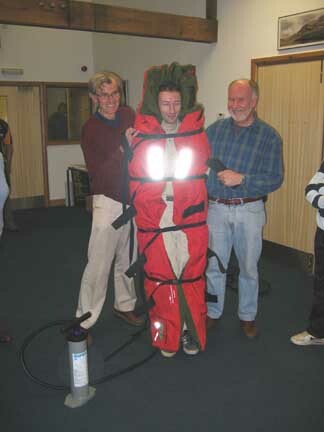 Gwyn explained the equipment carried. 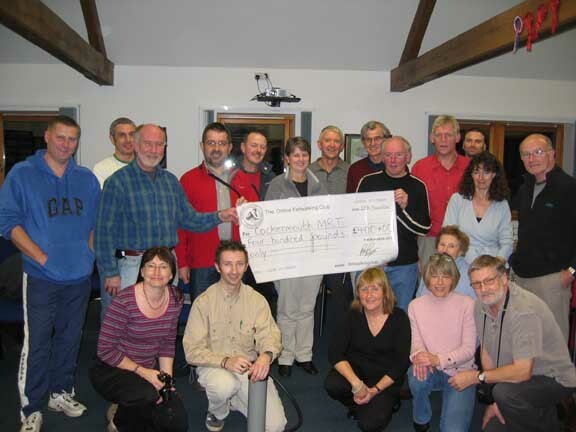 Peter presents the £400 cheque to the team. and we gather round for the official group photo. 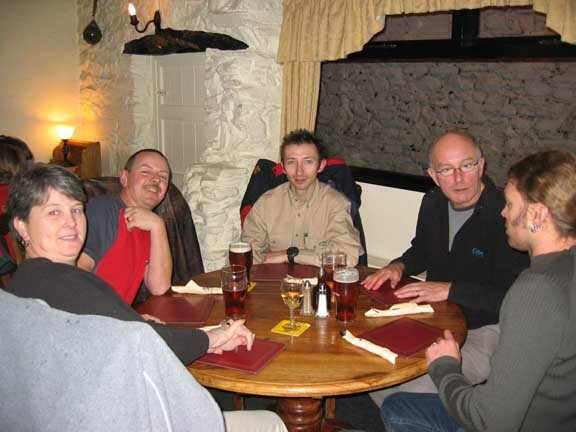 Stephen, John, Gwyn, Nigel, Dennis, Jackie, Derek, Peter Rigg, John, Myself, Ben, Jill R, Fred. 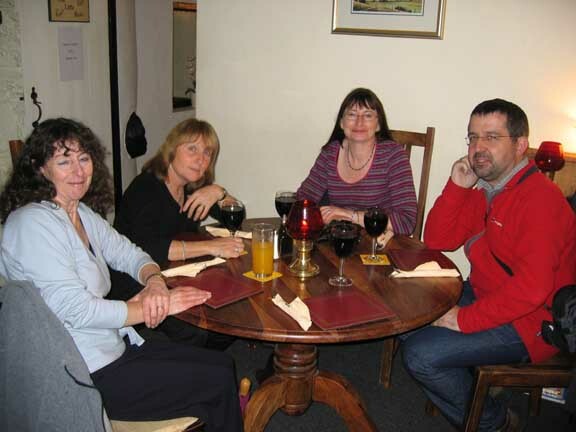 Jill B, Pete, Ann, Jo, Joanne, John P.
using a real life "volunteer" - you did volunteer didn't you Pete ? 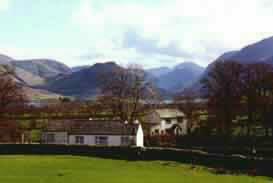 Afterwards we adjourned to the Kirkstile Inn in Loweswater for a meal and a beer. Jackie and Dennis Page, Pete Burgess, Fred Phillips and Ben Hammond. 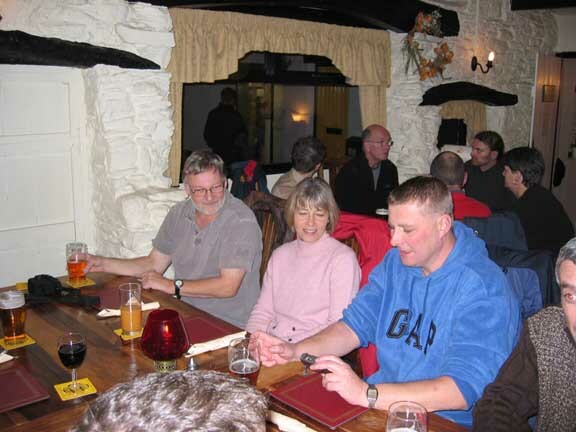 John Patterson, Jo Hall, Stephen Siddell. Jill Rowland, Ann, Jill and Nigel Batchelor. In all, eighteen of us enjoyed an excellent evening and retired to our various bed ready for an early start in the morning. 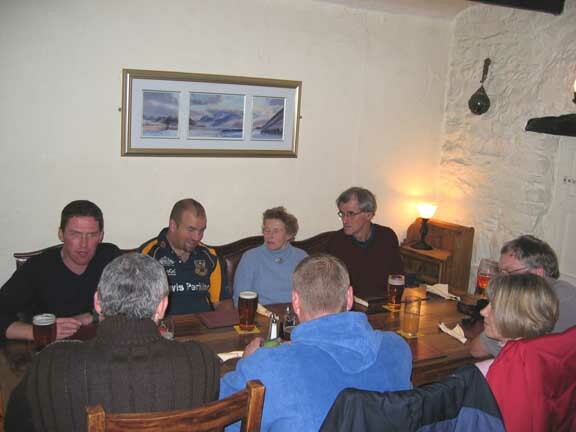 To find our what happened . . . .
Click here to view photos of The Great Gable Walk 2005. This site best viewed . . . without a big red straight jacket.